The contents of this page refer to alpha features in Spinnaker 1.11. This means we are working on their stability and usability, as well as possibly adding or changing features. Expect rough edges, and file issues as needed. This guide shows the basics of how to manage traffic during deployments using Kubernetes Provider V2. This includes automatically attaching a Service to a workload during deployment, and defining pipelines to perform blue/green deployments. Notice that the selector app: myapp appearing on the Service did not have to be specified on the Replica Set’s PodSpec; Spinnaker adds this automatically. The list of Services supplied in this annotation does not need to specify all Services a workload may be attached to. 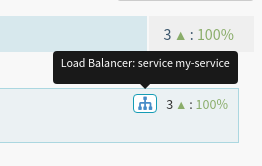 If your workload’s labels already attach it Service A, and you list Service B in the annotation, both Service A and B will route requests to this workload. You can think of this annotation as only supplying the list of additional services to attach to, not as an exhaustive list. If you use this annotation, Spinnaker will edit the workload’s labels, either in the metadata.labels, or spec.template.metadata.labels sections. As a result, if the labels added to or removed from the spec.template.metadata.labels conflict with the label requirements in the object’s spec.selector.match[Labels/Expressions] section, the deployment will fail. This annotation tells Spinnaker which service or services to make traffic changes to. For example, if you specify service “A” in the annotation of a manifest and subsequently disable it, only traffic from service “A” will be disabled, even if you receive traffic from both services “A” and “B”. Spinnaker supports dynamically enabling and disabling traffic to a particular Kubernetes resource. This can be used in a pipeline to configure Blue/Green rollouts, as shown below. Spinnaker manages traffic using labels, and has to edit them on running resources. 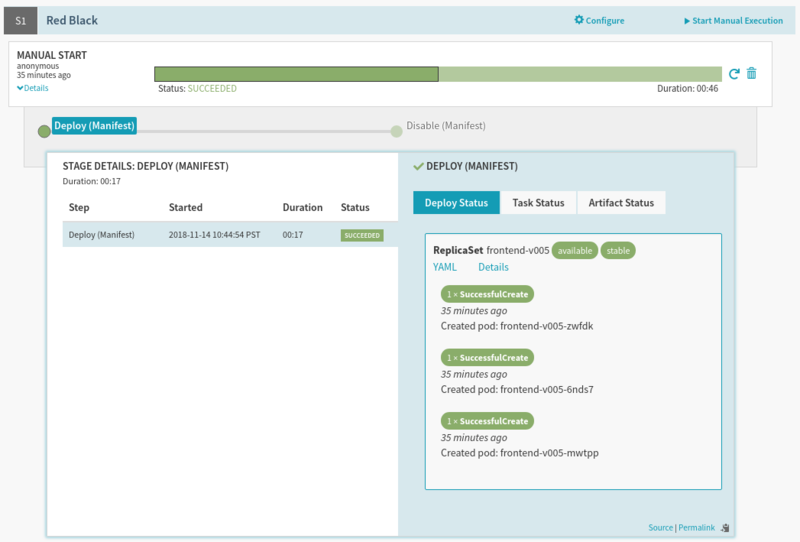 Given that edits to Deployment objects trigger rollouts, the only way to carry out Blue/Green deployments without editing the Service object directly is using Replica Sets, which are safely edited in-place by Spinnaker. To be clear, these label edits are abstracted into higher-level “Enable” and “Disable” stages to manage traffic, and are described below. In turn, when a user submits a change to a Replica Set (either ad-hoc, or using a pipeline) to update an image, configuration, etc… Spinnaker makes sure to deploy a new Replica Set with a unique -vNNN suffix. This is in contrast with the edits to labels Spinnaker performs in place to manage traffic. 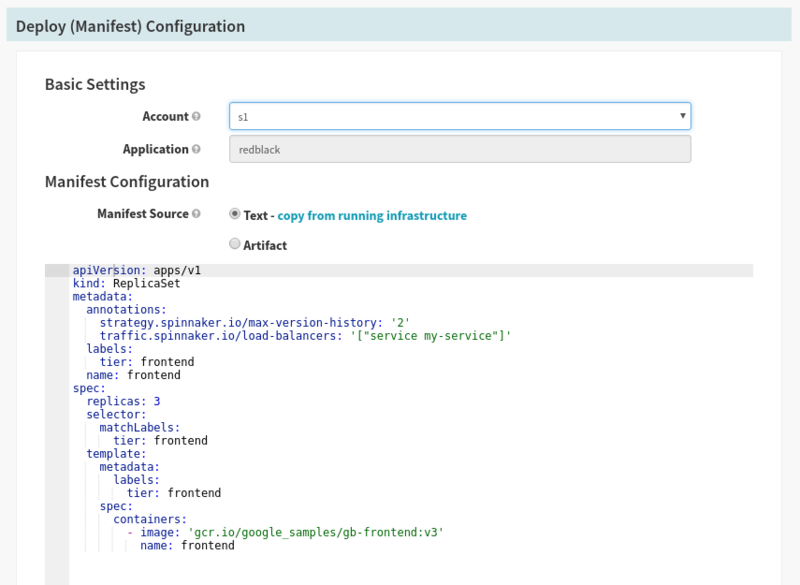 The interaction between edits to Replica Sets made by users and those made by Spinnaker will be made clear in the below sample pipeline walkthrough. This annotation is explained above, and and is used here to both indicate to Spinnaker which Service to attach during deployment time, and which Service to detach during the disable stage. This annotation is explained in the reference section, and is used to ensure that no more than a certain number of versions of this Replica Set are running for garbage collection purposes. With every run of the pipeline a new Replica Set is created, and therefore we cannot know ahead of time which version of the Replica Set to disable. This field allows us to pick a Replica Set based on the Target value. By picking the Second Newest target, we select the second newest Replica Set when this stage starts, or in other words, what was just previously serving traffic.